The Best Actor award went to Ranveer for portraying Alauddin Khilji in one of the 2018’s biggest hit Padmaavat, while the Best Actor critic’s choice award went to Ayushmann Khurrana for his stellar performance in Badhaai Ho. The award for the best actor in a negative role went to another Padmaavat actor Jim Sarbh, while Kiara Advani bagged the Emerging Star of the Year award at the annual award ceremony and Khatta Meetha actress Trisha Krishnan took home the trophy for the 'Best Actress of the Decade' category. All the celebrities had put their best fashion foot forward as they became the part of the award night. Here are some of the photos and videos of the celebs, who attended this ceremony on Saturday. 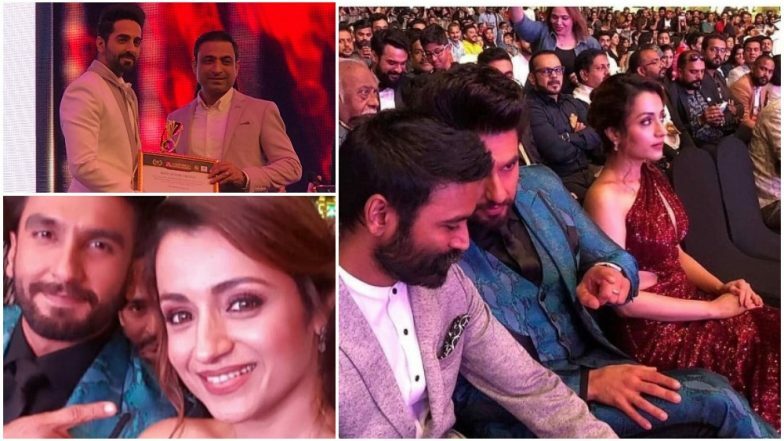 Going by the videos from the starry night that have surfaced on the internet, the who’s who of south Indian cinema were seen bonding with the A-listers of B-town. In one of the videos, we see Ranveer Singh was congratulating the Raanjhana actor Dhanush for winning the Best Actor critic’s choice award for his performance in Vada Chennai/Mari 2. The star attendees seem to have had a great time together at the starry gala night. On the professional front, Ranveer Singh would next be seen in '83, while Kiara Advani would be seen in Good News and Ayushmann Khurrana would be seen in Dream Girl. Stay tuned to LatestLY for more updates.